In this Part we will explore the meaning of the 33rd Shloka of Sri Vishnu Sahasranamam. 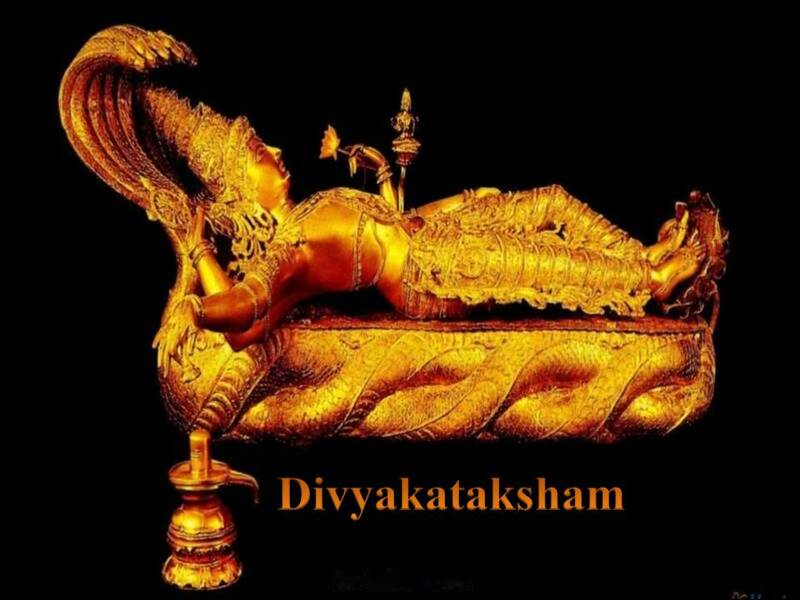 Sri Adi Sankara defines this as ‘Yugaadeh Kaalabhedasya Kartritvaat, Yugaanaam aadim aarambham karoti iti vaa – He is called Yugaadikrit either because He creates the divisions of time starting from a Yuga or because He starts the origin of each set of Yugas. The first meaning implies that He is called Yugaadikrit because He is the cause of periods of time such as Yuga. The other meaning given by Sankara implies that He is the Institutor of the four Yugas – Satya, Treta, Dvapara, and Kali Yuga and sets up this division of time. According to Swami ChinmayAnanda, this Nama refers to the divisions of time such as centuries, years, months, days, etc. Sri Radhakrishna Shastri suggests that through these divisions of time, like the day and night following each other, He gives a meaning of continuity to time which is otherwise a never-ending chakra or circle with no beginning or end. 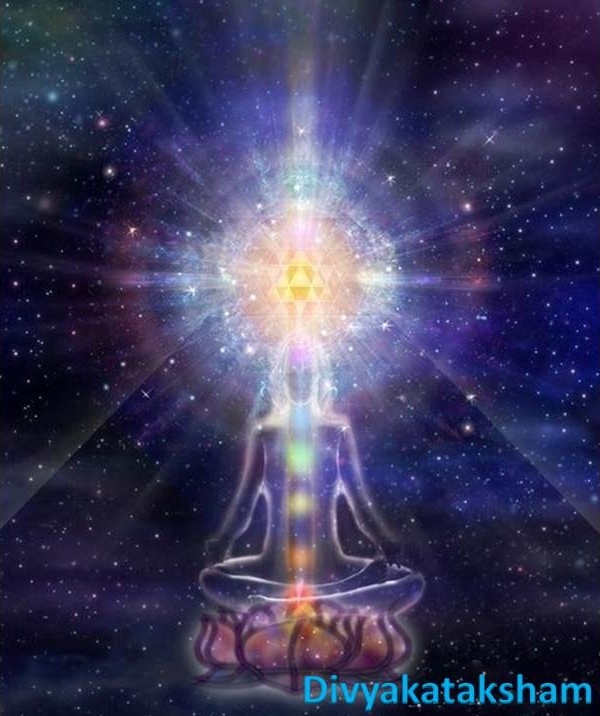 The word Yuga is derived from the root ‘yuj – yoge’ meaning to unite. He creates the continuity or connectivity between one Yuga and the next by ensuring that the life-forms are re-created according to their karma. 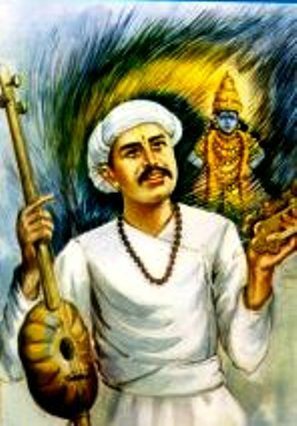 Sri Parasara Bhattar gives the interpretation “Yugasya ante’pi aadim karoti” – Even at the end of a Yuga, He begins another. Even at the dissolution of the Universe, He saves it from the distress of deluge by commencing with the creation of another Universe all over again. Sri Satyadevo Vashishtha interprets Yuga as Kaala-Chakra, Adi as beginning, and the term Yugaadi as referring to the Sun, who is the cause of the division of time as day and night etc. He interprets Yugaadikrit as the One who created the Sun or the Kaala Chakra. The writer in Dharma Chakram points outs the limited nature of our body and our life in this world in the context of this huge, immeasurable, and unending, Kaala or time. Instead of wasting it on petty goals, and worrying about the past, which is gone or the future on which we have no control, we should learn to meditate on Him in the present, over which we have control. Sri Adi Sankara says ‘Yugaani Kritaadeeni Aavartayati Kaalaatmanaa iti’ meaning ‘with his nature of being the very structure of time, He continuously cycles the Yugas from Satya Yuga to Kali Yuga and so on’. Avarta refers to revolution or rotation. Sri Parasara Bhattar’s interprets that He is Yugaavartah because He makes the Satya and other Yugas go round again and again with their respective dharmas. It is said that the extent of dharma in the society in Satya Yuga was 100%, that in Treta Yuga was 75%, in Dvapara Yuga was 50%, and that in Kali Yuga is 25%. This rotation is seen in a dimension where we can relate to it easily in the form of day and night, the four seasons with their constant attributes repeating time and again. He is not only the Creator of Time as we saw in the previous Nama, but He is also the administrator of Time as we see in this Nama. Based on his Advaita philosophy Sri Adi Sankara interprets this as ‘Eka Maayaa na Vidyate Bahveer Maayaa Vahati iti Naikamaayah – He is Naikamayah because he is the Creator of several illusions or false perceptions of the world’. Only a man of wisdom is able to see through the false appearances and appreciate the underlying unity of the Universe. Sri Parasara Bhattar interprets this Nama in a different way based on his Vishishtadvaita philosophy. According to him Maya here refers to knowledge or wonderful truths, and should not be interpreted as illusion. He is Naikamayah because of His innumerable and wonderful exploits. He gives several examples to point out the use of the word not as illusion but as truth, knowledge, etc. 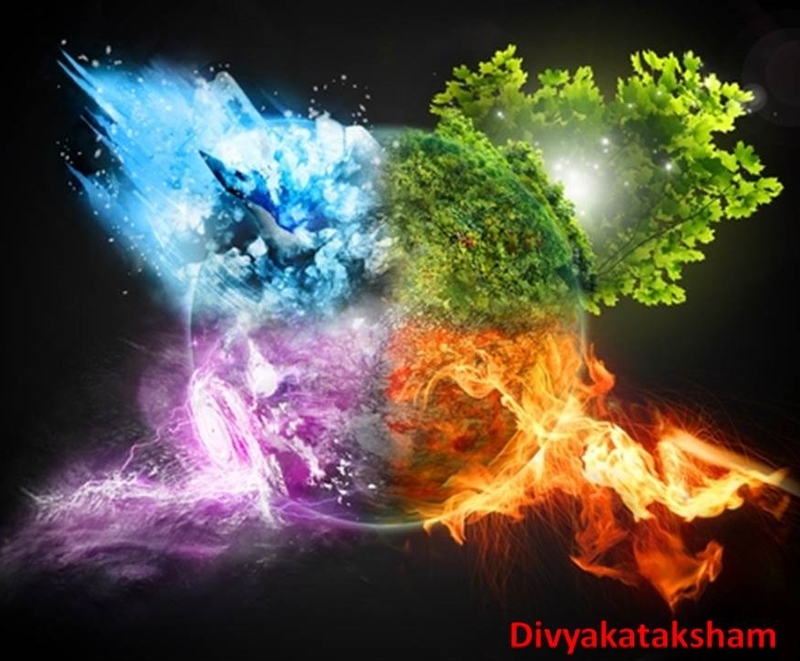 “Maayaam tu prakritim vidyaat” – Know that maya is prakriti or Primordial Matter. 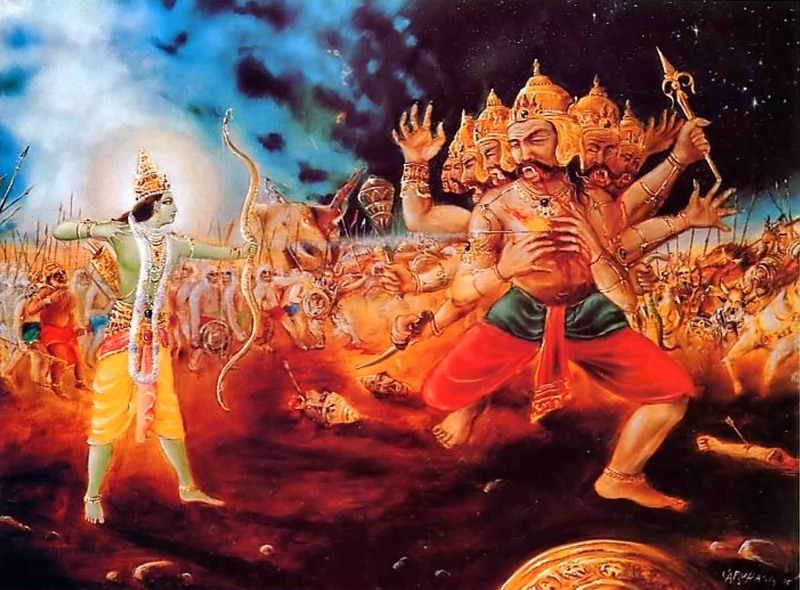 In Vishnu Purana, there is a mention of Lord Vishnu destroying the thousands of Mayas of Sambaraasura with His discus. If Maya here refers to illusion, then a discus was not needed to destroy it; so here Maya refers to real objects. Sri Satyadevo Vashishtha derives the meaning from the root ‘maa-maane’ – to measure, and gives the interpretation that this Nama means that He has innumerable dimensions to Him. This story shows Lord’s Leela of creating an illusion to curb the Ego of Sage Narada, the greatest of Seers. Once Sage Narada was practicing intense austerities. Indra, the King of the Devas, grew suspicious that he might be trying to dethrone him. He sent Kamadeva to lure him with worldly pleasures to break his penance. A beautiful damsel emerged from Kama’s arrow and began enticing Narada by dancing before him, but in vain as the Sage’s eyes remained closed to her charms. 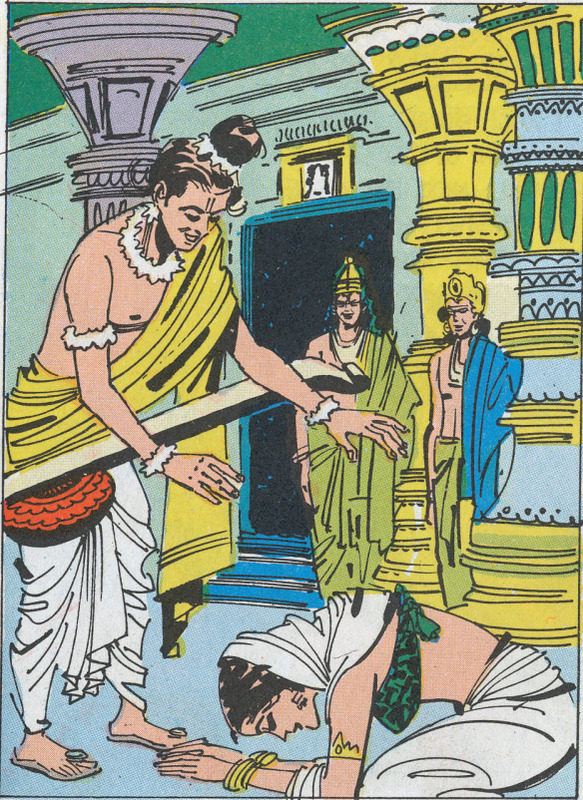 Kamadeva had to acknowledge defeat. Narada opened his eyes and said, “Go and tell Indra that Lord Shiva is not the only conqueror of desire. Narada went to Kailash and gloated about his achievement to Lord Shiva. Lord Shiva asked him not to brag in front of Lord Vishnu. Sage Narada thought that Lord Shiva was jealous and felt that Lord Vishnu would be mighty pleased about his victory. So he went straight to Lord Vishnu’s abode and paid his respects. 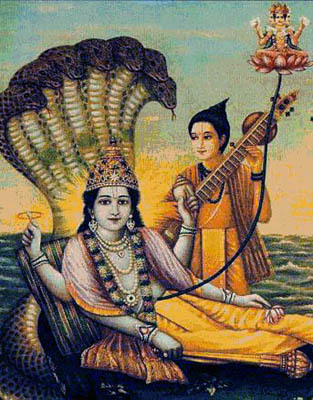 Lord Vishnu invited the Sage warmly and said, “Come Narada, I am very pleased to see you”. 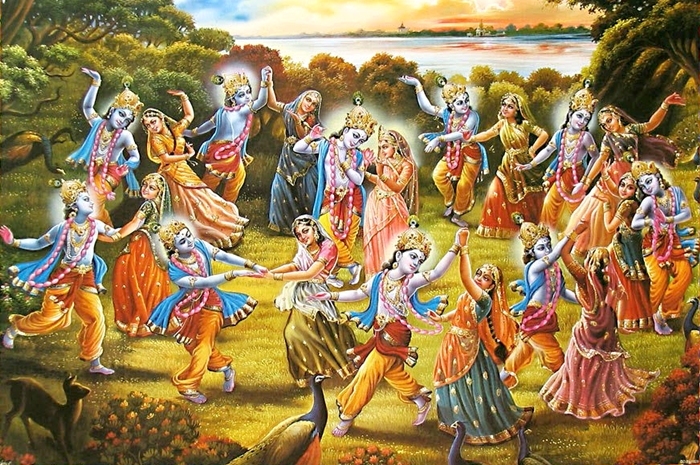 Narada replied, “You will be more pleased to know that I your devotee I am above temptation too. Lord Vishnu laughed and said, “Is that so? Never cease to be on your guard”. But Narada’s pride had blinded him so much that he could not read Vishnu’s warning. As Sage Narada moved on he stumbled upon a beautiful city. Intrigued by its beauty, he stopped by and visited the King Sheelanidhi. 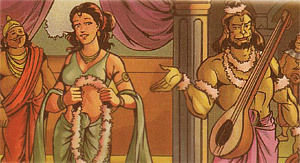 During the visit, he was told about the king’s daughter, the beautiful Shrimati’s Swayamvara (marriage). He instantly recognised her as the incarnation of Goddess Lakshmi and knew that none other than the great Lord MahaVishnu in glory and power could marry her. Smitten by her beauty, Narada was overcome with desire to marry her. Blinded by lust, he prayed fervently to Lord Vishnu and sought a boon to “Look like Hari”. Lord Vishnu granted him the wish. Confident of his looks, he went to the Swayamvara and stood alongside several Kings who had come to win over Shrimati’s hand. Shrimati, thinking of Lord Vishnu, walked past him, without caring to notice him to his utter dismay and astonishment. Ignoring the crowd’s banter, Narada persisted, but in vain. Shrimati walked on, her eyes searching and longing to see her Lord. Lord Vishnu miraculously appeared and accepted her garland, much to her happiness and to the angst of Narada. Narada, fuming with rage, went to Lord Vishnu and asked him: “Why did you cheat me?” “I asked for a face of Hari and you bestowed me with a face of a monkey!” He demanded an explanation. 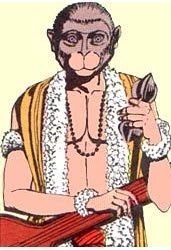 Lord Vishnu calmly replied: “Narada, as a great scholar, don’t you know that Hari also means a monkey? Now, tell me. Did I dupe you? Will I be stuck with this face forever?” Asked Narada. 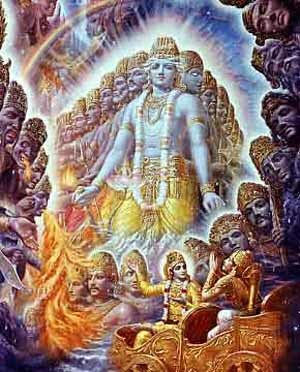 Lord Vishnu replied, “Look around you, Narada. “All the events around you were nothing but Maya’ an illusion. “There was no city, no kingdom, no Princess and no monkey face”. Sage Narada was dumbstruck as everything around him had vanished. Seeing him perplexed, Lord Vishnu laughed and said, “It was an illusory creation of mine to assuage your pride and to make it known that even you, the greatest of Sages is not above temptation as you believed or boasted. 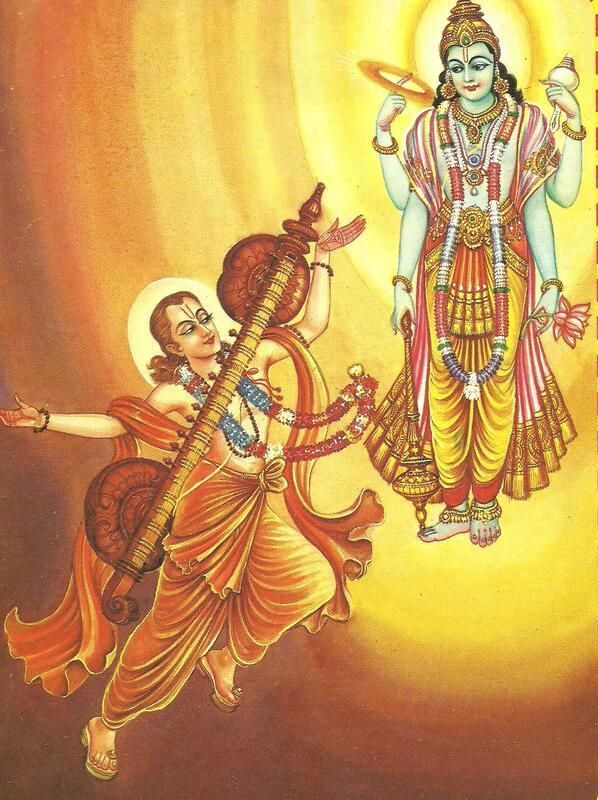 Narada, in all humbleness realised his mistake and paid obeisance to Lord Vishnu for having enlightened him. Hence, He is Naikamayah because he is the Creator of several illusions or false perceptions of the world. Sri Adi Sankara puts it ‘Mahad Ashanam asya asti Kalpaante Sarvagrasanaat iti Mahaashanah – One who has a huge appetite as demonstrated by what He consumes at the end of the world’. Ashanam refers to food. Since all the creations disappear at the time of deluge it seems that they become food to satisfy the enormous appetite of Bhagavan at that time. 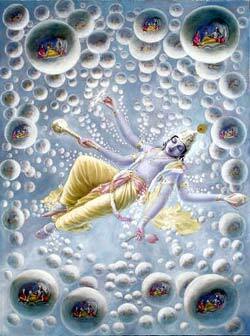 Meaning: During Cosmic cycle of dissolution (Pralaya), you swallowed the entire Universe; such a Large mouthed Lord! You are the most resplendent lustrous with a Divine Body, The Lord Srinivasa, who is standing gracefully at Tirumala! I hail from a family who have surrendered themselves at your service. I pray to you my Lord to reach your Lotus feet. Meaning: He who devoured the seven worlds, clouds, mountains and seas is contained inside me, tightly held. Sri Satyadevo Vashishtha gives another additional derivation for this Nama based on ash – vyaaptau sanghaate cha meaning to pervade, to accumulate. So in addition to the meaning that His appetite is huge, he also gives the alternate interpretation that His pervasion or vyaapti is large and extensive. Drish means visible and so Adrishyah means someone who is invisible. Sri Adi Sankara says ‘Sarveshaam Buddheendriyaanaam agamyah Adrishyah meaning He is not perceivable by any of our organs of knowledge’. So Adrishyah not only means invisible to the eyes but also He is imperceptible to other sense organs such as ear, tongue, nose and skin. Meaning: The Self is Unknowable by the senses, unthinkable by the mind and is not subject to any kind of change. Knowing that the soul is invisible, inconceivable, immutable, and unchangeable, you should not grieve. The writer in Dharma Chakram points out that He is Adrishyah because He cannot be recognised through the five senses, or by logical analysis. For that matter, it is only His Grace that enables his devotees to realise him. “When the entire world has met with destruction, how come this child is alive and lying down (on a leaf)? Even though I try to understand this through the power of my austerities, I am unable to understand the true nature of this child”. Sri V.V. 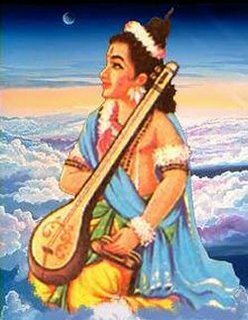 Ramanujan refers to NammAzhwar’s pasuram – “katkilI unnaik kANumARu aruLAi” form Thiruvai Mozhi (7.2.3) meaning One who cannot be seen through our normal vision. Even though he is invisible to the 5 senses he is perceptible to his ardent devotees and Yogis in their meditation. As Sri Adi Sankara puts it ‘Sthoolaroopena vyaktam svaroopam asya iti Vyaktaroopah meaning His form is well-defined and perceptible’. It is possible that each person can have his own vision and version of Bhagavan. The Vyaktaroopa revealed to one devotee can be very different to the Vyaktaroopa revealed to another devotee. This alternative meaning of Vyaktaroopa is made clear by Sankara where he says ‘Svayamprakaashamaanatvaat Yoginaam vyaktaroopah iti vaa meaning Because of His own shine he is perceivable in a clear form to the Yogis’. Basically it is what Bhagavan chooses to reveal Himself as in the meditation of the Yogis. In the Dhyana Shloka we have already seen ‘Yogibhir Dhyaana Gamyam – He is perceptible to the Yogis in their meditation’. In the previous Nama we noted Him to be Adrishyah, and now we encounter Him as Vyaktaroopah. The difference is that in the previous Nama we explained that He cannot be seen through the normal means of perception. In the current Nama we note that He is easily perceived by His devotees who have transcended the influence of the five senses. Sri Radhakrishna Shastri points out that the cha in the Slokam – vyaktaroopashcha – indicates that even while being Adrishyah, He is of vykata-roopa or manifest form to His devotees, through so many incarnations etc. “He, who is like the blue lily flower in colour, and who is adorned by the SrIvatsa mole, appears to me always as the abode of Lakshmi”. “O Dear! His two feet with red surface adorned by the lovely soft and red toes, were firmly placed on my head when I bowed with bent head and worshipped Him”. 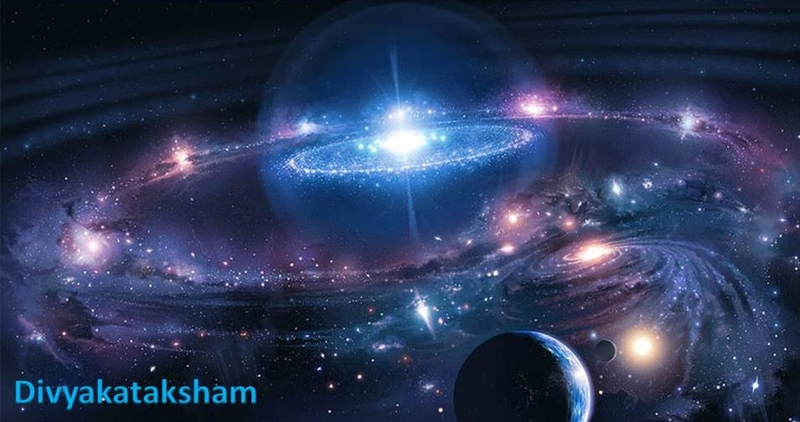 The Dharma Chakram writer points out that the previous Nama revealed Vishnu’s attribute which is beyond our perception, and the current Nama reveals His attribute of being present in everything as antaryami (in-dweller). 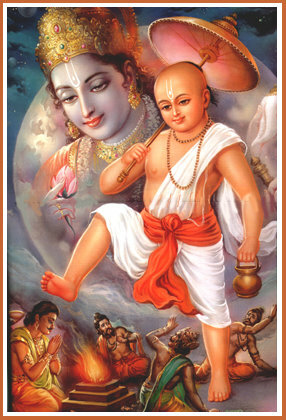 Sri Adi Sankara says ‘Suraareenaam Sahasraani yuddhe jayati iti Shasrajit – He is called Sahasrajit because he has conquered over thousands of Asuraas in battles’. Though Sahasra means thousand literally it should be taken to mean innumerable and this is clarified in the next Nama. Sri Paarasara Bhattar interprets the ‘thousands’ here as referring to thousands of eons or Time, which He conquers by being in Yoga-nidra while everything else is dissolved in Pralaya or deluge. Sri Adi Sankara interprets this as ‘Sarvaani Bhootaani Yuddhakreedaadishu Sarvatra Achintya Shaktitayaa Jayati iti – He is able to defeat everybody in every form whether in play or in a fight with his unimaginable prowess’. This Nama is even wider in scope than Sahasrajit, the previous Nama, by extending his victory over Asuras to that of victory over all beings and ranging from battle to that of a game of skill or play as well. Sri Parasara Bhattar says that He is Anantajit because He has everything under His control. In every incarnation He alone wins in the end and His Mahimaa or greatness is beyond comprehension. 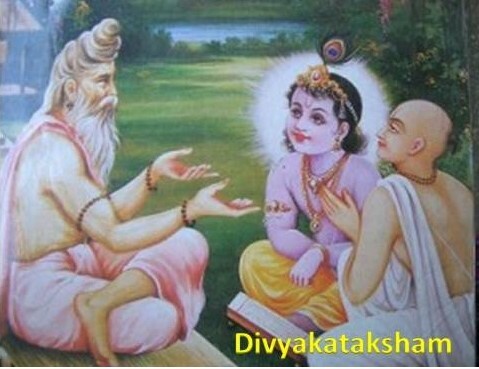 He is called Yugaadikrit either because He creates the divisions of time starting from a Yuga or because He starts the origin of each set of Yugas. He is Yugaavartah as He makes time periods come again and again. With his nature of being the very structure of time, He continuously cycles the Yugas from Satya Yuga to Kali Yuga and so on. HE is Naikamayah because he is the Creator of several illusions or false perceptions of the world. HE has a huge appetite as demonstrated by what he consumes at the end of the world during Pralaya. He is not perceivable by any of our organs of knowledge as He is Adrishyah. Even though He is invisible to the 5 senses HE is perceptible to his ardent devotees and Yogis in their meditation. Hence HE is Vyaktaroopah. He is called Sahasrajit because he has conquered over thousands of Asuraas in battles and He is Anantajit because He is able to defeat everybody in every form whether in play or in a fight with his unimaginable prowess and He has everything under His control. In every incarnation He alone wins in the end and His Mahimaa or greatness is beyond comprehension. 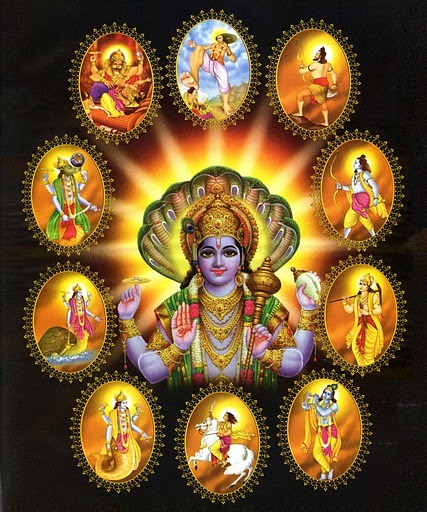 This Vishnu Sahasranamam series is authored with help of my friend Shri Balaji. I want the English meaning of Sri Paratvada Panchakam. This is really great enlightenment, I am very happy to see how much you work hard. Thank you. God bless you! Hari Om! Beautiful commentary! Missing your audio visuals!!!!!!!!!!!!!!!!! Hari Om Uncle! I love the cute little feet of Vamana and the story. Thank you very much Uncle. Thank you Shambavi 🙂 Hari Om!